The UK is taking 1000 refugees. Other countries are taking 100,000's. We are being mocked in the worlds press. 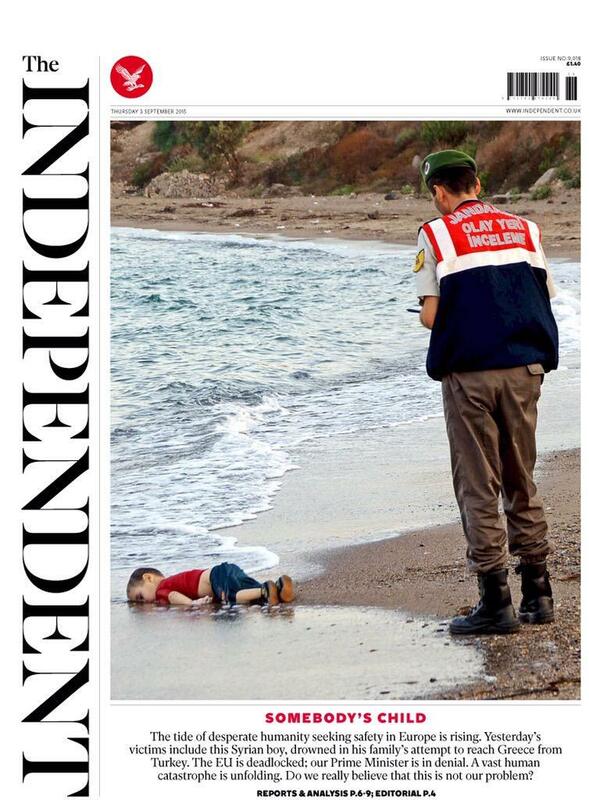 All the while we are seeing dead toddlers wash up on beaches in the med. Are we really that self centred, uncharitable, intolerant? It is truly shameful. The pictures accompanied by the disgraceful use of language by Cameron and the vast majority of the media is stomach churningly vile. We are taking the correct approach. Taking in hundreds of thousands of refugees, assuming of course they are all refugees (which they are not and even St Merkel has acknowledged that those who are not will be returned to their country of origin from Germany), is no solution because hundreds of thousands more will arrive in their wake. A wiser suggestion has been put forward recently that I hope will be explored, namely fully funded temporary camps at agreed locations for refugees only, with economic migrants returned to their country of origin (to apply for visas, just like other economic migrants). In addition to that more action from all countries in Europe to stop people leaving Syria and Libya in the first place needs to be taken. Maybe if other EU nations (including the British Parliament) had backed Cameron when he wanted to tackle Assad a few years ago we wouldn't find ourselves in this situation now. Incidentally, the UK is not the only country to be resisting taking in hundreds of thousands of migrants and of those who started out doing so, some are now having second thoughts. Of course not all countries are destination countries and if Germany want to adopt an open door policy then that is their prerogative. Nobody else is under any obligation to do the same and indeed they are not doing the same. Irony, irony. Americans are in no position to criticise anyone else, bearing in mind their attitude towards central Americans. A wiser suggestion has been put forward recently that I hope will be explored, namely fully funded temporary camps at agreed locations for refugees only, with economic migrants returned to their country of origin (to apply for visas, just like other economic migrants). In addition to that more action across Europe to stop people leaving Syria and Libya in the first place. I believe you have claimed to be a Christian in the past. If you are going to start insulting me, even if it is in total ignorance, then I'll simply report your post(s). So stop right there and address the issues I have raised or don't respond. How is calling you a Christian insulting you? I'm interested in how Christian values square with your post above. Temporary camps near to the countries of origin are recognised (Red Cross, etc) as the best way to return people to their country of origin after the situation is over. However, the war in Syria (and Libya) are years away from being over if not decades. The temporary camps in Turkey and Jordan are overflowing. We have gone beyond temporary camps nearby, the number fleeing are just overwhelming. If we had bombed Assad, we would now have ISIS in control of a whole country. The mess is so huge and both 'winners' quite unpalatable. The neighbouring countries are either overwhelmed (Jordan), basket cases (Iraq, Lebanon), not taking refugees (Israel) or bombing all sides (Turkey). Our solution seems to be the hope that the area will calm down quickly, which is slightly unlikely. I thought you would of approved of the USA's view towards economic migrants? 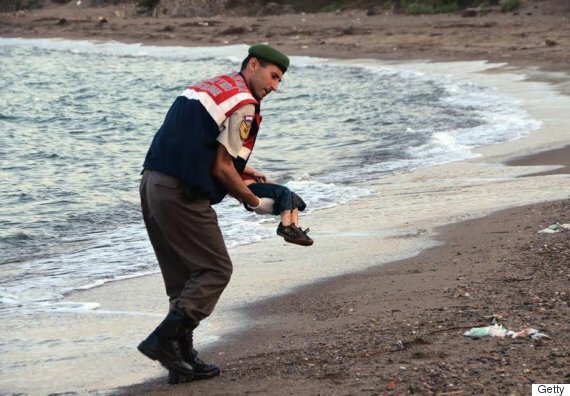 Before people start getting into "politics" and point scoring look at that picture, that's a small child who's parents were so desperate they took an incredible risk. They are fleeing from what is to us in our nice warm houses, unimaginable horror. They are horrible brutal pictures. I am torn about posting them (genuinely). However, if that's what it takes for action to take place. 1. Help here in our country by taking in refugees who are that desperate to escape the devastation of their country. 2. Help there by substantial intervention, be it military, aid or preferably both. A public aid cry through charity isn't enough. To do neither is moral cowardice of a grand scale that shames Britain. There's nothing "strong" about turning away desperate people and doing absolutely nothing to help them. There's nothing "strong" about boasting about how we're stopping them coming here in Calais. David Cameron today said: "We have taken a number of genuine asylum seekers from Syrian refugee camps and we keep that under review, but we think the most important thing is to try to bring peace and stability to that part of the world. I don't think there is an answer that can be achieved simply by taking more and more refugees." Go on then Dave, tell us what you're doing to bring peace and stability to that part of the world beyond sending a few fighter/bombers to the area and a few rebadged special forces squads. That's unfair. Remember, it was Cameron who wanted to intervene in Syria when Assad first started to kill his own people but Parliament voted against any action being taken. If we had gone into Syria at that point, we would not now be seeing the refugees. You should be pointing the finger at the MPs who voted against action when action could have been effective. Intervene now and we would be taking on ISIS as well as Assad. A very tough Save the Children video that shows it if it happened here. Really, a tough one. Maybe leave it to tomorrow if you're just heading off to bed. No, it's not unfair. Cameron has a moral choice to make, if he can't persuade Parliament to intervene then he has to take the moral high ground of the consequence and take more refugees. To both refuse to intervene (and he may be stopped by Parliament) and to also refuse to take the consequences then he's either a coward or has the moral standards of a far-end psychopath. Britain can't have it both ways, we can't abstain from everything and then pretend we're anything other than moral cowards. Sad pictures indeed. However, that doesn't change my belief that simply taking in hundreds of thousands of refugees is the solution (and I still think illegal economic migrants should be returned to their home country). Interests:Rugby league, obviously, I support Wigan and St.Judes.<br />Photography, keen amateur.<br />Rugby league's social history.<br />Local history.<br />Travel. This is very true. Cameron has to accept that the consequences of his failure to persuade his coalition to intervene early are what we have now. He now bleats about wanting to solve the problem at source to stem the flow of refugees, well go on then Dave, as you said earlier CKN, tell us how you will do it. Cameron is allowing innocent people to die to save his political neck. Cameron took the Syria matter to Parliament and MPs like those you support blocked him from taking action in Syria when to do so would have lanced the growing boil. He was humiliated in the process. So if there is anyone who should be facing their moral cowardice it is those MPs and folk who supported their stance at the time because they allowed this situation to be created in the first place. However, we could continue this pointless argument or discuss potential solutions. Ha! He allowed a free vote. You would have criticised him if he'd used a whip and now you criticise him for allowing a free vote. Your leftie MPs are the ones who allowed innocent people to die. They've been dying in droves since they voted against intervention in Syria. I had to go digging for this as it was in my mind but I couldn't place it. In 1938, the Évian Conference was held in France to discuss the plight of German Jews. In short, 32 of the world's leading nations all were publicly concerned about the plight of the Jews in Germany and Austria but none were willing to help beyond their "quota". Britain especially refused to increase its quota because we had not enough jobs. That was fixed the next year though. Same in Rwanda. Evidence was given to every country in the UN that a genocide was about to happen, what did we do? Nothing beyond wring our hands and say "sorry, not our problem". Same moral cowardice, same end result. If only seven of those Tories who voted against had voted for or if 14 Tory abstentions had turned up then the vote would have been won. Indeed. As the Mirror article says "Cameron asks MPs to back military action in principle but dozens of Tories joined Labour to vote against him"
Labour voted against Cameron. That 30 Tory MPs joined him is no surprise but that meant a great deal more Tories voted for action in Syria. Did any Labour MPs vote for action in Syria? I'm sure we can do more. Even after many years of absorbing net inward migration of 300,000 a year and goodness knows how many illegal immigrants ( given that the ones discovered in trucks on the M20 etc are just the failed tip of the iceberg) we have the resources, money, space etc to welcome many many more. Indeed, a number of high-profile political individuals have volunteered to take refugees into their own homes. Why not make that possible? Or is that just rewarding those refugees who have paid people traffickers to get them to Europe, those with the guts,stamina, motivation and survival instinct to flee violence and oppression? What about the millions who have not been able to achieve that? Are not they an even bigger problem? One Scottish MEP, I forget his name, was on the radio today saying how much room there was in Scotland...well, there's an opening for the First Minister to show her humanity.